Full-length human RPA-14 expressed in E Coli. RPA3 antibody was raised against recombinant human RPA3. Long term: -20 degree C; Short term: +4 degree C. Avoid repeat freeze-thaw cycles. 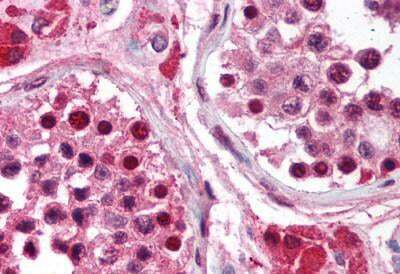 Anti-RPA3 antibody IHC of human testis. Immunohistochemistry of formalin-fixed, paraffin-embedded tissue after heat-induced antigen retrieval. Antibody concentration 5 ug/ml.